How does Eva’s Village feed a hot meal to more than 300 people every day? They rely on plenty of volunteers and generous corporate sponsorship. Spencer Savings Bank, a community bank headquartered in Elmwood Park, N.J., did both today, sponsoring an entire meal and sending volunteers to help serve and clean up. Eva’s Village is a non-profit anti-poverty organization in downtown Paterson, dedicated to changing the lives of the hungry, homeless and addicted. Spencer Savings Bank is a long time corporate sponsor of Eva’s Village “Fund-A-Meal” program. 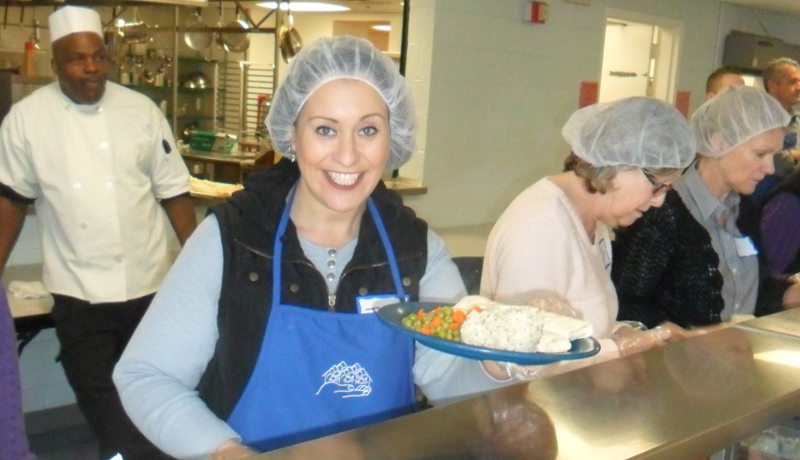 Through the sponsorship, employees of Spencer Savings Bank donate their time and services to prepare and serve meals to help feed members of the community that don’t have access or means of obtaining nutritious food. Several bank employees toured the organization’s facilities that span a three block radius in Paterson, N.J. and learned of the 17 programs offered at Eva’s Village, which include Eva’s Kitchen, emergency overnight shelter for men and women, shelter for women with children, transitional housing for homeless men and homeless women with children, various addiction treatment programs, a recovery center, free primary medical and dental care clinic, affordable housing, an access center and outpatient mental health services. The Spencer Savings Bank team, accompanied by Dave McIndoe, President and Owner of Netwave Interactive Marketing, then aided the organization’s volunteers in preparing Eva’s Community Kitchen from start to finish. They set the plates, prepared the food, served over 300 hot meals to people in need from the local community, and then cleaned up at the conclusion of the meal.